Have you ever wanted WordPress animations to spice up your website with some subtle effects? The freely-available animate.css toolset can help you make it happen in most decent browsers–and won’t break things for older browsers, either. Check out the general animate.css demo, and then learn how to use it to add some hop, skip, and jump to WordPress! I’ll show you different ways to animate your web content. No matter which ways you use, the first step is the same: include the “animate.css” file in your site’s “head” area. First, visit the animate.css github page. For now, just click the “ZIP” button to download the complete repository. Later, you’ll see how to create a custom build of the CSS to keep your included file size as small as possible. Unzip the downloaded file and have a look inside. The complete set of animations is included in the “animate.css file,” but we’re interested in the “animate.min.css” file. It has been minified to cut down on file size. For this tutorial, I’m using the Twenty Eleven theme. I made a folder named “css” inside the “twentyeleven” folder, and copied the “animate.min.css” file there. You might think it’s okay to just put a style link directly in your head area, usually found in header.php for WordPress themes. That’s a big no-no. Instead, you’ll use WordPress’ “enqueue_style” function. See the enqueue_style Codex page if you need more information on how the function works. Open your theme’s “functions.php” file, scroll to the end, insert the following code, and save the file. Adding the stylesheet for the “wp_enqueue_scripts” hook will add it for every front side page of your site. The “animated” class is required for any element you want to animate. The “wobble” class is but one of many different keyframe effects you can apply. See the animate.css homepage for a complete list of effects. My friend–there is no next step! Save your page and view it to see that blockquote wobble. The wobble is pretty neat, but it starts as soon as the page loads, and might be easy to miss. Here’s how to tell the animation to run a certain number of times. For the example, you’ll make it loop infinitely. I know–that is getting completely out of hand. I’ll address that in a moment! For now, just know that you need all 4 of those declarations for these CSS3 effects to work in different browsers. Your blockquote should be wobbling back and forth, again and again. Pretty cool! It can also get annoying, but I’ll talk about that in a bit. Right now, your blockquote wobbles as soon as the page finishes loading. Here’s how to make it wait 5 seconds before wobbling. Save the file. Then, edit your post again and add the “delay3” class to your blockquote element. The class attribute should now read “animated wobble delay3”. Save your post and go have a look. The wobbling should wait 5 seconds before it starts. Save the post and test. While you shouldn’t see any different behavior, your HTML is much cleaner. Now you can make the wobble effect occur over a longer period of time–say 5 seconds. (The default for most effects is 1 second.) This should make the effect look slower, as you stretch the same number of movements (keyframes) over a longer time. If you leave out !important the default duration will be used instead of your new 5 seconds. Edit your post, add the “duration5” class to your blockquote, save and test. I don’t know about you, but I think having an element animate like this, all by itself, is mostly annoying and useless. I’d rather animate elements in response to some user action. The simplest example is to animate the element when visitors move their mouse over it. For the animate.css classes, the rules that make elements actually animate are specified in the “animated” class. That selector is defined in the “animate.min.css” file, which you really shouldn’t alter, since the developer might make updates. You need to look at the “animated” rule in “animate.css,” discover what rules make an element animate, and copy them to the “myselector:hover” rule. Then you can remove the “animated” class from your HTML element, since your new “hover” rule includes what you need. It looks like the “animation-duration” and “fill-mode” are the important declarations to make animation begin. Back in the HTML of your post, simplify the “blockquote” element. Remove the “animated” class–that’s taken care of by your “pekanimate:hover” class. You do need to leave the specific animation type class, such as “wobble.” So, set your blockquote to the following, save, and test by hovering over the blockquote on the published page. We just learned a lot while implementing method 1. Requiring HTML edits to manually add classes, though, is not practical in a lot of situations. Perhaps you have content authors uncomfortable editing HTML, but you need them to add an animated call to action (CTA) on some posts. You can make that easy on your authors by building the animated element into your theme templates. Adding an animated element to a template. Let’s say you want an animated element after your title and before the content on individual blog posts. In the “Twenty Eleven” theme, the title and content for single posts are controlled by the file “content-single.php,” so open that file. The title and optional meta information are wrapped in a “header” element. You’ll add your CTA as the last element inside the “header” element. Here is my call to action text for the demonstration. Save those changes to “content-single.php” and go view any single blog post. When you mouse over the CTA, it should begin to wobble. Then, add the “pekcta” class to your CTA element in the “content-single.php” file. Save your changed files and reload the single blog post on your site. I think you’ll agree that is a bit better than just plain text. Now you have an animated element requiring no manual HTML editing. 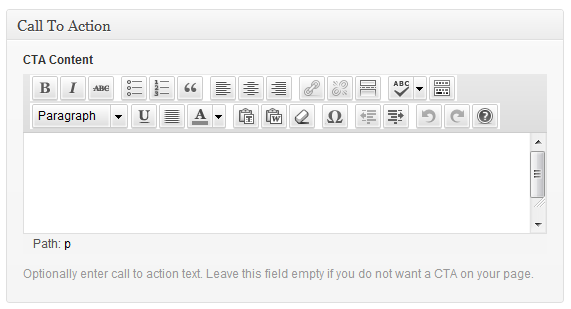 However, you need to be able to edit the content easily, and optionally choose to have the CTA not show at all. You’ll do that by adding a few custom meta boxes to the post editing page, then adding logic to the “content-single.php” file. There are many ways to use custom field values in your posts. Indeed, you could just use the built-in custom fields panel and give your authors instructions. However, you can make the edit screens more professional and easier to use by adding custom meta boxes to the edit screen. You could code that manually, or use one of many good plugins available. I’m going to show you how to use the “More Fields” plugin. In your dashboard, go to “Plugins > Add New,” search for “more fields,” then install and activate the “More Fields” plugin. Go to “Settings > More Fields,” and click “Add new input box” on the “More Fields” screen. Enter “Call to Action” as the title of the box. Check only “Posts” for the “Used with post types” option, since we’re only gearing single post templates to make use of the CTA. After saving, the “More Fields” screen lists the new box, which you can now add fields to. Click “Edit” in the “Actions” column for your “Call to Action” box. Enter “CTA Content” as the field title. Enter “pek_cta_content” as the custom field key. Choose “WYSIWYG” as the field type. Now edit a post where you want to use the CTA. Scroll down, and you’ll find the “Call to Action” box you just made. Note: if your main content editor is on the “HTML” tab, the Call to Action box WYSIWYG editor toolbar will not appear. Simply choose the “Visual” tab in the main content editor and refresh your page. Enter your CTA message in the “CTA Content” field. You probably should create a link in the text, since this is a call to action. After all–your visitors need an action to perform! Save your post. Now that you have an easy-to-use field for entering call to action content, you need to alter your template file to make use of the field. You’ll be replacing the new “pekcta” div we made earlier. 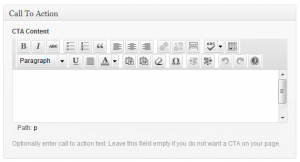 Save the file and go reload the blog post that you added CTA text to. Great! You now have control over the CTA without editing any HTML! 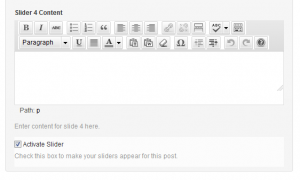 You’re going to give authors the option of creating a slider, right from the Edit Post screen. I’m taking an example from the animate.css author’s site and adapting it to WordPress. Enter “Post Slider” as the title of the box. Check only “Posts” for the “Used with post types” option. Click “Edit” in the “Actions” column for your “Post Slider” box. Enter “Slider 1 Content” as the field title. Enter “pek_slide1_content” as the custom field key. Add new fields for as many sliders as you want to allow. I recommend at least 3 and no more than 6. Be sure to change the name of the field title and custom field key to reflect the slider number. e.g., “Slider 2 Content” and “pek_slide2_content,” etc. After adding the fields for numerous sliders, you’ll add one more field to allow the slider to be turned on or off. Use “pek_slider_active” as the custom field key. Choose “Checkbox” as the field type. When you’re finished adding fields to your slider box, edit a post and add some content to at least 3 of the sliders, making sure to put a check in the “Activate Slider” box. Check if the “Activate Slider” checkbox is on. If it is, proceed. Add a “ul” element to contain all our slides. Check for each individual slider. Create the <li> slider with appropriate classes, then dump the slider contents in there, properly escaped. Add an activation button for the slider. When all slides have been checked / added, close the “ul” element that contains all slides. Add the slider buttons HTML. Download my modified version of the Twenty Eleven theme’s “content-single.php” file. It’s well-commented, so you can understand what’s going on. 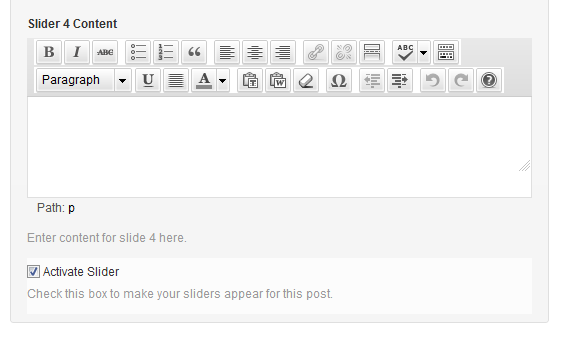 After saving changes to your template file, view the sample post you made with slider content. After the post’s normal page content, you should see an unordered list containing an item for each of your slides, followed by a line of linked text items like “Slider 1,” “Slider 2,” etc. Open your style.css file, scroll to the bottom, and add some new rules you need for the sliders to function properly. Third, styles for the inactive sliders. Fourth, styles for the active sliders. In your theme folder, make a “js” folder, if it doesn’t already exist. In the “js” folder, create a new file named “animate-css.js”. Add the following to the end of your “paukai_2011_styles” function and save the file. That should do it! Refresh the post you added slider items too, and click the different slide links to watch your new slider in action. Throughout this tutorial, you’ve been using a fully-loaded animate.css file. While minimized into animate-min.css, it still clocks in at 47K. The entire tutorial only makes use of animation effects for “wobble,” “fadeInLeft,” and “fadeOutRight.” You can build a custom css file including only the animation effects you really intend to use, thereby cutting down your file size page load time. The animation effects are listed under different classifications, such as “Attention seekers,” “Flippers,” and so forth. Click “uncheck all” for each of the classifications. Then just check on the three effects we’re actually using. Click “Build it” and download the resulting css. For the effects we use in this tutorial, the custom build file is only 5K–and it isn’t even minified! Minifying the file at http://www.minifycss.com/css-compressor/ with the “High” compression level takes that down to 1.9K. NOTE: If you do this, you are required to keep the comment block that includes the license at the top of the css file. The compressor will remove such comments, but you need to keep the license text, one way or the other. Give your custom build file whatever name you want. Copy it to your theme’s “css” folder. Finally, visit your “functions.php” file to edit the name of the css file you want WordPress to enqueue. Good heavens, don’t let this turn out like the old HTML <blink> tag! 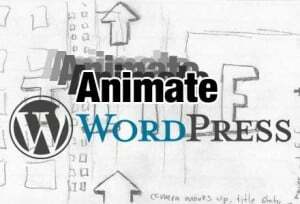 I hope you now understand the mechanics of adding animate.css effects to your WordPress site. Do you have any questions I didn’t answer well? Are there other ways you’d like to use animate.css that I didn’t cover? Let me know what you think in the comments. I’d love to help you futher.